Get closer to your employee engagement and track improvements over time with more frequent feedback from your employees. With Qualtrics employee pulse surveys, you can measure fluctuations in engagement and step in to improve to improve the experience faster than ever. With an easy-to-use survey builder, in-product expertise, and intuitive employee directory management, ongoing pulse programs give you actionable, ongoing employee insights to drive better employee experience. 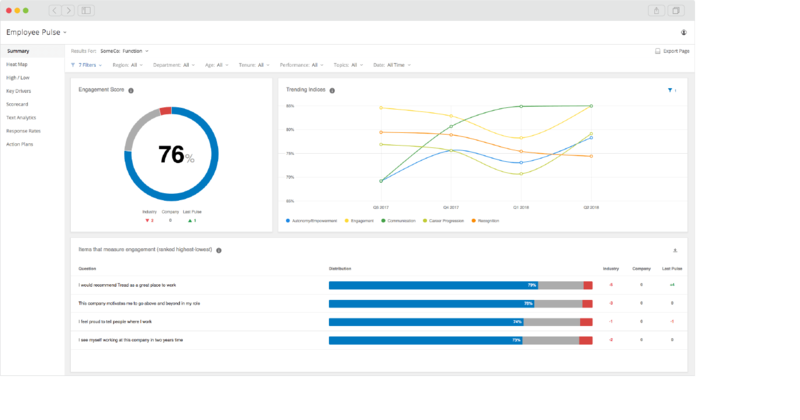 Make your decisions based on real-time insights with role based dashboards that help leaders and people managers act on employee feedback more frequently. With built-in and automatic analytics, drill down reporting, and robust filtering, it’s easy for even the most complex organisations to quickly gain a real-time understanding of their employees. Turn your insights into business impact with built-in action planning tools and expertise that help your managers implement improvements and monitor progress of the actions that will improve the employee experience. Stay in control of your employee experience with professional-grade survey software with you in the driving seat. Choose from a pre-built program, or create, test, and customise your employee surveys in minutes with no coding or IT support required. With multiple question types, embedded data, advanced branching and display logic, triggers, and mobile compatibility, it’s never been easier to put the voice of your employees at the heart of your most critical decisions. Ensure your leaders get every ounce of insight from their employee pulse surveys with Qualtrics iQ – our predictive intelligence engine that bakes artificial intelligence and machine learning right into your employee pulse dashboards. Qualtrics iQ automatically analyses and surfaces critical employee insights within the data. With advanced statistical, predictive, and text-based analysis, you’ll instantly know which actions to take to have the biggest impact on your organisation’s KPIs. What are Employee Pulse Surveys? While full-scale employee engagement programs are an extremely effective method for delivering robust employee engagement insights they can also be limited in their flexibility and ability to capture frequent changes and developments in employee engagement and experience. In fact, organisations can no longer afford to wait a year or two to gather employee and organisational data. Employee pulse surveys are the answer to providing more frequent, agile, and actionable employee feedback to drive organisation impact. 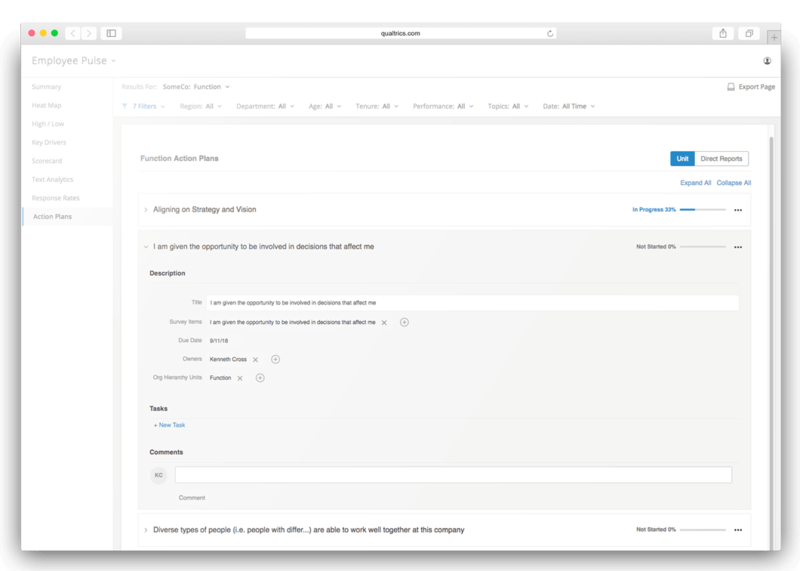 Employee pulse program harness the power of the Qualtrics employee experience platform, offering automated organisational hierarchy management, intelligent text and statistical analytics, and action planning built directly into the software. Now, people analytics teams can easily, quickly, and flexibly deploy pulse surveys, collect feedback into easy-to use dashboards, analyse data in real-time, and manage the entire action and impact reporting from within a single dashboard.